What Are The Negative Health Effects Of High Fructose Corn Syrup? High fructose corn syrup includes any corn syrup that has gone through an enzymatic process to convert some glucose into fructose to produce a preferred sweetness per requirement of the company’s product. In America, it seems like wherever you look, the sugary food items contain high fructose corn syrup. Instead of cane sugar, many food companies have resorted to high fructose corn syrup owing to the factors of cost effectiveness and sweetness. However, as the use of high fructose corn syrup increased, so did the obesity rate. Correlation does not mean causation; however, many researchers are now looking to see why such a relationship exists. High fructose corn syrup includes any corn syrup that has gone through an enzymatic process to convert some glucose into fructose to produce a preferred sweetness per requirement of the company’s product. The name can be misleading because it implies that high fructose corn syrup only contains fructose. In regular table sugar, there is a 50/50 yield of glucose to fructose. 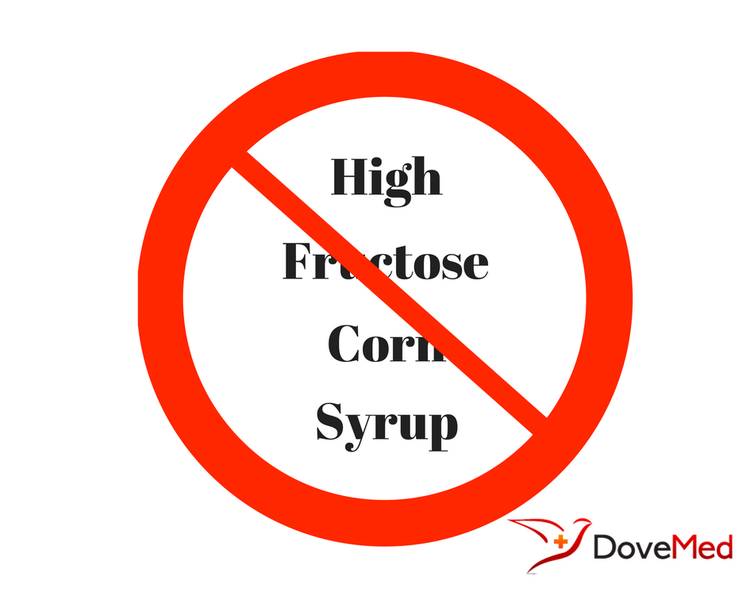 Depending on the product, the fructose to glucose ratio can differ with high fructose corn syrup. HFCS-55 is used mostly in soft drinks with approximately 55% fructose and 42% glucose. HFCS-42 can be used in beverages, processed foods, cereals, and baked goods with approximately 42% fructose and 53% glucose. A 2004 commentary in The American Journal of Clinical Nutrition proposed that when compared to glucose, the altered digestion of fructose might be an important problem in increasing obesity rates. Fructose can convert to fat more quickly than glucose, and fructose causes less of a rise in the hormones insulin and leptin, both of which increase feelings of fullness after a meal. Subsequent interviews by two of the authors included that there was a distorted emphasis on high fructose corn syrup, and the overall issue was the overconsumption of any sugar. A 2010 review of the Nutrition & Metabolism suggested that consuming moderate amounts of fructose could reduce an appetite if consumed before a meal, lower blood sugar spikes compared to glucose, and delay exhaustion if consumed during exercise. Research published by the American Society for Nutrition showed that the average intake of added sugar was 77 grams per day, which equals 19 teaspoons or 306 calories. However, the American Heart Association (AHA) has suggested a much lower amount of added sugars that one should eat in a day. Men should consume no more than 150 calories per day or 9 teaspoons in the added sugar form; women should consume 100 calories per day or 6 teaspoons or less. Excess sugar consumption is linked to obesity, type II diabetes, heart disease, various forms of cancers, tooth decay, and non-alcoholic fatty liver disease. Evidence from Princeton University even showed that sugary junk foods excite the same areas of the brain as drugs of abuse. Like every other type of sugar, high fructose corn syrup should be consumed with extreme precaution. Therefore, it is generally advised to consume the following products sparingly: soft drinks, fruit juices, and candy. Goran, M. I., Ulijaszek, S. J., & Ventura, E. E. (2013). High fructose corn syrup and diabetes prevalence: a global perspective. Global Public Health, 8(1), 55-64. Stanhope, K. L., Bremer, A. A., Medici, V., Nakajima, K., Ito, Y., Nakano, T., ... & Keim, N. L. (2011). Consumption of fructose and high fructose corn syrup increase postprandial triglycerides, LDL-cholesterol, and apolipoprotein-B in young men and women. The Journal of Clinical Endocrinology & Metabolism, 96(10), E1596-E1605. Angelopoulos, T. J., Lowndes, J., Zukley, L., Melanson, K. J., Nguyen, V., Huffman, A., & Rippe, J. M. (2009). The effect of high-fructose corn syrup consumption on triglycerides and uric acid. The Journal of nutrition, 139(6), 1242S-1245S. Moeller, S. M., Fryhofer, S. A., Osbahr III, A. J., & Robinowitz, C. B. (2009). The effects of high fructose syrup. Journal of the American College of Nutrition, 28(6), 619-626. Bray, G. A. (2007). How bad is fructose?. The American journal of clinical nutrition, 86(4), 895-896. Bray, G. A. (2010). Fructose: pure, white, and deadly? Fructose, by any other name, is a health hazard. Journal of diabetes science and technology, 4(4), 1003-1007.